Despite our sometimes inclimate weather, Portland has a pretty phenomenal food cart scene. While many focus on fairly traditional food cart fair, a handful have unique offerings and are destinations for more than just a main meal. Of all these food carts Sip is my absolute favorite. Located in the courtyard of the People’s Food Coop (3029 SE 21st Ave), Sip is a small airstream trailer transformed into one of the best fresh juice bars in the entire city. Opened at the start of the summer, Sip made its name by offering devilshly delicious vegan milkshakes, so rich and tasty that even non-vegans could be seen licking their cups. In addition to its indulgent delights, Sip also offers a nice range of fresh and organic juices and smoothies. On a recent trip I had a tropical green smoothie which is by far the single best smoothie I’ve ever had, anywhere. With the turn of seasons Sip transitioned its offerings away from milkshakes and on more wintery offerings including hot soups and specialty drinks like milled cider, chai and hot coco. Recent soups have included Thai Red Curry, Vegan “Beef” Stew and Potato Leek. Sip is a prime example of perfect simplicity, it’s the kind of place you can go, order anything, and know that it’s going to be fresh, organic and delicious. There are rumblings that Sip’s owner is looking to expand and open a cafe in Portland, an extremely exciting prospect. Have you tried the Whole Bowl? Very good as well. I'll have to try a smoothie at sip, sounds great! I haven't tried the Whole Bowl yet. It's absolutely on my list! The Whole Bowl is absolutely incredible! It's after east of 39th on Hawthorne. i went to sip several times during the warmer weather and it was perfect every time. the owner is awesome, everything is organic, and most importantly its all vegan. i need to get down there again and try out some of these soups. 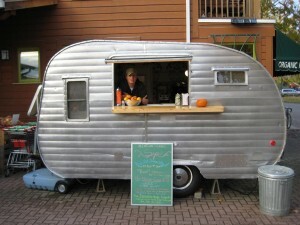 thanks for reminding me about this great little food cart. 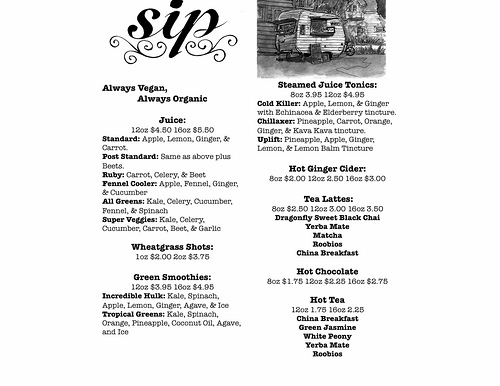 I LOVED Sip all summer long although I have yet to try their cold weather fare. I'm sure it will be just as tasty as the milkshakes that added to my Portland Ten (a NW version of the Freshman Five). That would be *inclement* weather… need an editor?